GtkTreeView implements AtkImplementorIface and GtkBuildable. Widget coordinates -- coordinates relative to the widget (usually widget->window. 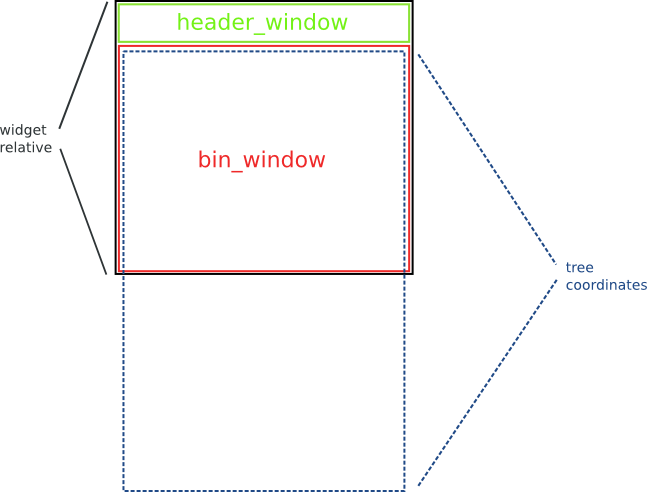 Bin window coordinates -- coordinates relative to the window that GtkTreeView renders to. Tree coordinates -- coordinates relative to the entire scrollable area of GtkTreeView. These coordinates start at (0, 0) for row 0 of the tree. Function type for determining whether column can be dropped in a particular spot (as determined by prev_column and next_column). In left to right locales, prev_column is on the left of the potential drop spot, and next_column is on the right. In right to left mode, this is reversed. This function should return TRUE if the spot is a valid drop spot. Please note that returning TRUE does not actually indicate that the column drop was made, but is meant only to indicate a possible drop spot to the user. Appends column to the list of columns. 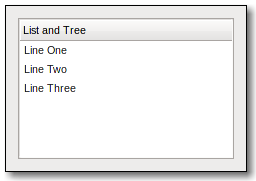 If tree_view has "fixed_height" mode enabled, then column must have its "sizing" property set to be GTK_TREE_VIEW_COLUMN_FIXED. This inserts the column into the tree_view at position . If position is -1, then the column is inserted at the end. If tree_view has "fixed_height" mode enabled, then column must have its "sizing" property set to be GTK_TREE_VIEW_COLUMN_FIXED. Creates a new GtkTreeViewColumn and inserts it into the tree_view at position . If position is -1, then the newly created column is inserted at the end. The column is initialized with the attributes given. If tree_view has "fixed_height" mode enabled, then the new column will have its sizing property set to be GTK_TREE_VIEW_COLUMN_FIXED. The position to insert the new column in. Convenience function that inserts a new column into the GtkTreeView with the given cell renderer and a GtkCellDataFunc to set cell renderer attributes (normally using data from the model). See also gtk_tree_view_column_set_cell_data_func(), gtk_tree_view_column_pack_start(). If tree_view has "fixed_height" mode enabled, then the new column will have its "sizing" property set to be GTK_TREE_VIEW_COLUMN_FIXED. If either tree_x or tree_y are -1, then that direction isn't scrolled. Sets the current keyboard focus to be at path , and selects it. This is useful when you want to focus the user's attention on a particular row. If focus_column is not NULL, then focus is given to the column specified by it. Additionally, if focus_column is specified, and start_editing is TRUE, then editing should be started in the specified cell. This function is often followed by gtk_widget_grab_focus (tree_view ) in order to give keyboard focus to the widget. Please note that editing can only happen when the widget is realized. Sets the current keyboard focus to be at path , and selects it. This is useful when you want to focus the user's attention on a particular row. If focus_column is not NULL, then focus is given to the column specified by it. If focus_column and focus_cell are not NULL, and focus_column contains 2 or more editable or activatable cells, then focus is given to the cell specified by focus_cell . Additionally, if focus_column is specified, and start_editing is TRUE, then editing should be started in the specified cell. This function is often followed by gtk_widget_grab_focus (tree_view ) in order to give keyboard focus to the widget. Please note that editing can only happen when the widget is realized. Fills in path and focus_column with the current path and focus column. If the cursor isn't currently set, then *path will be NULL. If no column currently has focus, then *focus_column will be NULL. This function is a convenience function to allow you to reorder models that support the GtkDragSourceIface and the GtkDragDestIface. Both GtkTreeStore and GtkListStore support these. If reorderable is TRUE, then the user can reorder the model by dragging and dropping rows. The developer can listen to these changes by connecting to the model's row_inserted and row_deleted signals. The reordering is implemented by setting up the tree view as a drag source and destination. Therefore, drag and drop can not be used in a reorderable view for any other purpose. Finds the path at the point (x , y ), relative to bin_window coordinates (please see gtk_tree_view_get_bin_window()). That is, x and y are relative to an events coordinates. x and y must come from an event on the tree_view only where event->window == gtk_tree_view_get_bin_window (). It is primarily for things like popup menus. If path is non-NULL, then it will be filled with the GtkTreePath at that point. This path should be freed with gtk_tree_path_free(). If column is non-NULL, then it will be filled with the column at that point. cell_x and cell_y return the coordinates relative to the cell background (i.e. the background_area passed to gtk_cell_renderer_render()). This function is only meaningful if tree_view is realized. Therefore this function will always return FALSE if tree_view is not realized or does not have a model. gtk_tree_view_get_visible_range is deprecated and should not be used in newly-written code. A GdkWindow, or NULL when tree_view hasn't been realized yet. gtk_tree_view_widget_to_tree_coords has been deprecated since version 2.12 and should not be used in newly-written code. Due to historial reasons the name of this function is incorrect. For converting coordinates relative to the widget to bin_window coordinates, please see gtk_tree_view_convert_widget_to_bin_window_coords(). gtk_tree_view_tree_to_widget_coords has been deprecated since version 2.12 and should not be used in newly-written code. Due to historial reasons the name of this function is incorrect. For converting bin_window coordinates to coordinates relative to bin_window, please see gtk_tree_view_convert_bin_window_to_widget_coords(). Creates a GdkPixmap representation of the row at path . This image is used for a drag icon. Note that even if this is FALSE, the user can still initiate a search using the "start-interactive-search" key binding. If the search column is set, users can use the "start-interactive-search" key binding to bring up search popup. The enable-search property controls whether simply typing text will also start an interactive search. Enables of disables the hover selection mode of tree_view . Hover selection makes the selected row follow the pointer. Currently, this works only for the selection modes GTK_SELECTION_SINGLE and GTK_SELECTION_BROWSE. Enables of disables the hover expansion mode of tree_view . Hover expansion makes rows expand or collapse if the pointer moves over them. The return value indicates whether there is a tree view row at the given coordinates (TRUE) or not (FALSE) for mouse tooltips. For keyboard tooltips the row returned will be the cursor row. When TRUE, then any of model , path and iter which have been provided will be set to point to that row and the corresponding model. x and y will always be converted to be relative to tree_view 's bin_window if keyboard_tooltip is FALSE. Returns the column of tree_view 's model which is being used for displaying tooltips on tree_view 's rows. If you only plan to have simple (text-only) tooltips on full rows, you can use this function to have GtkTreeView handle these automatically for you. column should be set to the column in tree_view 's model containing the tooltip texts, or -1 to disable this feature. A private struct for internal use only. The definition of this structure is not publically available. GtkTreeView:row-ending-details has been deprecated since version 2.22 and should not be used in newly-written code. The "row-activated" signal is emitted when the method gtk_tree_view_row_activated() is called or the user double clicks a treeview row. It is also emitted when a non-editable row is selected and one of the keys: Space, Shift+Space, Return or Enter is pressed. Set the scroll adjustments for the tree view. Usually scrolled containers like GtkScrolledWindow will emit this signal to connect two instances of GtkScrollbar to the scroll directions of the GtkTreeView.